GATE 2019 Application form related details are now available on this web page. The interested candidates can check the details before applying GATE 2019 Application form through official website. The exam authority of GATE released the notification online on 6th July 2018. The application submission process will be started form the 1st September 2018 via the official website. The link will be activated on the official web portal by using that you can submit your application form. The candidates who are going to apply for the GATE 2019 Exam should note down the starting date of application form. The exam board will start accepting the application form by 1st September 2018 through the official web portal. The candidates should check the GATE 2019 Notification before applying the application form online. The candidates who will pass the eligibility criteria for the exam will able to apply GATE 2019 Application form online. The registration process will be completed through the GOAPS (GATE Online Application Processing System). The candidates can fill the application form up to 21st September 2018. And pay the application fee until October 1st, 2018. If you failed to pay the application fee before the late fee then your application form will also reject by the officials. So, try to fill the application form and fee before the deadline given on the official website. 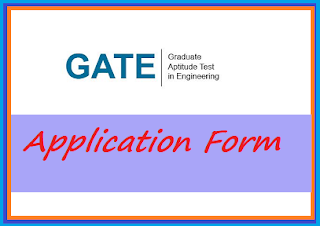 How to apply for GATE 2019 Application form/ Registration? The candidates who are going to apply for the GATE exam should check the eligibility conditions given on the official website. Or you can check the latest released notification of GATE 2019 available on this web page. Let's discuss the process to successfully submit the application form or registration for GATE 2019. First of all, you have to register yourself on the official website of GOAPS using your name, email address, and mobile number. After the successful registration, you will get the enrollment number which will be used for the login by the user. Now, the candidates need to provide legit and correct details in the blank spaces which will ask for the personal, academic, contact, college, and photo details. You have to select the GATE 2019 paper and exam center as well. The candidates should upload the recent photo and signature with the caste certificate (if required) in the prescribed size and format on the official web portal. The candidates can pay the application fee through the online mode i.e. debit/ credit card or net banking before the last date mentioned on the official web portal. Finally, the candidates should submit the application form after rechecking the details that you filled in the application form to avoid the mistakes. Don’t forget to take the printout for further use. The exam board will open the window for application form correction in the 2nd or 3rd week of the November 2018. The candidates should fill the GATE 2019 Application form carefully or don’t miss the correction. The candidates who will successfully submit the application form and fee will able to make the correction in the application form by logging in to their account on the official GOAPS account. But you can’t edit the entire application form. Only a few options will be available that you can make corrections.